Olive Turner might have lived through eighty-four Christmases, but she’ll never get bored of her favourite time of year. And this one’s set to be extra-special. It’s the Gin Shack’s first Christmas – and there’s a gin-themed weekend and a cocktail competition on the cards! But, beneath the dazzle of fairy lights and the delicious scent of mince-pies, Olive smells a rat. From trespassers in her beloved beach hut to a very unfunny joke played on her friends, it seems that someone is missing a dose of good cheer. Olive knows she’s getting on a bit – but is she really imagining that someone in the little seaside town is out to steal Christmas? More importantly, can she create the perfect gin cocktail before Christmas Eve – in time to save the day? For those who have stopped by lately will know how much i loved the Gin Shack and couldnt wait for a repeat visit whilst i continually searched for my perfect G&T. It obviosuly wasnt going to take long was it? Olive is getting ready to celebrate her favourite time of the year and with lots to celebrate including the Gin Shacks first gin weekends and a cocktail competition, i was fully expected just a nice little catch up with Olive and the gang. What i wasn't expecting was some of the hardships they came across. Not just a few badly poured gins but jokes that are a little passive agressive and an almost meeting with death. 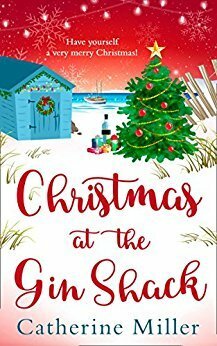 Christmas at the Gin Shack is a wonderful read with a perfect blend of gin (& the odd mention of wine) friendship & drama. It is a good read to curl up with on a cold night and remind ourselves of the festive season that seems a lifetime ago. Christmas at the Gin Shack is the second book however i do beileve you can read this alone and still completely understand the narrative, however its nice to be familiar with the characters, especially as we see them change, maybe its the festive season ? Whatever is causing the changes around the Gin Shack, some are for the better & others not so much. What i do know is that i loved this book & some of those festive cocktails were everything i would ever want to drink!